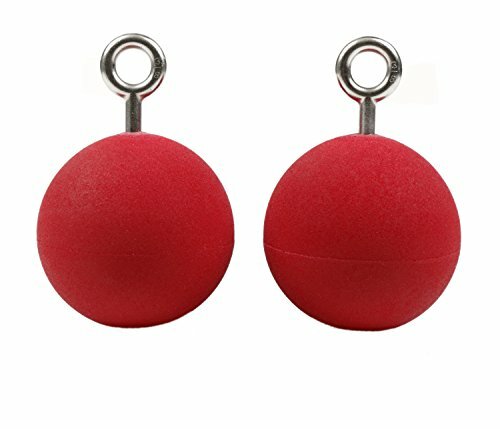 The spherical/sloper shape of the Bomb makes these perfect to give you a forearm burning workout. What you can expect to do on the Bombs are lock offs, typewriter, pull ups, dead hang and most importantly the ever so important core strength workouts you need to have to climb efficiently on steep walls. There are not many training aids on the market that allow you to train "around" a hand injury, but the Bombs do. With their open hand concept design, all of your hand tendons lay ergonomically around the ball allowing you to continue to stay on top of your core and upper body strength; injured or not. Never surrender! Since you can rotate the Bombs while on them, you can switch from pull up, to chin, to biceps pull up all in one set. The diameter of each Extra Large Bomb is 4.5 inches in diameter which is the size of a really big grapefruit or the mid-section of a football. The eye bolt measures 5/16" and will accommodate a climbing rated carabiner, quick link, 6mm static cord and/or chain. Chain works the best to extend the Bombs to the exact height you want them to hang. Looped and sewn webbing is the second best option. Static cord is a cost effective alternative but it poses the challenge of getting the holds to hang even. You can also use quick draws. Common places to hang the bombs are from pull up bars, rafters, doorways and of course, everywhere you would think of putting up a hang board. They also are very cool to set boulder problems with! Production Note: Each Atomik Bomb has a horizontal seam from the manufacturing process, which does not compromise the quality of this product and will not interfere with your workout experience. The XL Bombs are sold as a set of 2. Comes in red. The color may vary from the photo. Safe, open-hand design so tendons lay ergonomically. Spherical shape increases forearm and grip strength, boosting endurance. Switch from pull-up, to chin-up, to biceps-pull without regrouping. Extra Large (4.5") Bombs have embedded black painted eye bolts.